Background: The study evaluates a group of Military Service Members specialized in blast explosive training called “Breachers” who are routinely exposed to multiple low-level blasts while teaching breaching at the U.S. Marine Corps in Quantico Virginia. The objective of this study was to determine if there are any acute or long-term auditory changes due to repeated low-level blast exposures used in training. The performance of the instructor group “Breachers” was compared to a control group, “Engineers”. Methods: A total of 11 Breachers and four engineers were evaluated in the study. The participants received comprehensive auditory tests, including pure-tone testing, speech-in-noise (SIN) measures, and central auditory behavioral and objective tests using early and late (P300) auditory evoked potentials over a period of 17 months. They also received shorter assessments immediately following the blast-exposure onsite at Quantico. Results: No acute or longitudinal effects were identified. However, there were some interesting baseline effects found in both groups. Contrary to the expected, the onsite hearing thresholds and distortion product otoacoustic emissions were slightly better at a few frequencies immediately after blast-exposure than measurements obtained with the same equipment weeks to months after each blast-exposure. Conclusions: To date, the current study is the most comprehensive study that evaluates the long-term effects of blast-exposure on hearing. Despite extensive testing to assess changes, the findings of this study suggest that the levels of current exposures used in this military training environment do not seem to have an obvious deleterious effect on hearing. Auditory complaints are among the most common symptoms of Service Members returning from deployment. Auditory damage from gunfire is usually assumed to be the predominant cause of combat-related military hearing loss, but blast exposure is another potential source of auditory damage, and the most current data show that blast exposure is common in deployed Service Members. It is estimated that at least 19.5% of deployed Service Members have been exposed to high-intensity blast explosions, leading to a multitude of injuries, including, in the most serious cases, traumatic brain injury (TBI). Lew et al. reported that 62% of patients with blast exposure and TBI complain of hearing problems. Hoffer et al. evaluated Marines with mild TBI (mTBI) from combat blasts and found that prevalence of hearing loss was 33% in acute patients and 49% in chronic patients. Gallun et al. found that 44% of blast-exposed Service Members performed abnormally on two or more tests of central auditory function. In another study conducted at Walter Reed National Military Medical Center (WRB, Besthesda, Maryland), preliminary data indicate that as many as 40% of Service Members who were near high-explosive blasts during combat performed abnormally on tests using complex sounds when compared to a nonblast-exposed group with similar peripheral hearing thresholds. One interesting finding of the Gallun et al. study, and of other studies conducted at WRB, is that a significant number of individuals exposed to blasts in combat report hearing difficulties and perform poorly in complex auditory tasks, even in cases where (1) hearing thresholds fall in the normal or near-normal range, and (2) blast exposure was not severe enough to generate the altered level of consciousness required for a formal diagnosis of mild TBI. The etiology of these auditory symptoms is not clear. Animal studies have shown that even moderate amounts of noise exposure may produce changes to the peripheral auditory system that are not evident in the pure-tone auditory threshold, so it is possible that the hearing problems reported by blast-exposed listeners are peripheral in nature despite the relatively small changes observed in the audiogram. High-explosive blasts may also damage the pathways of the central auditory system., Understanding speech in complex environments with competing sounds requires selective attention, memory, and other cognitive abilities to be intact. The areas of the brain and central nervous system that govern these cognitive abilities are known to be vulnerable to damage from high-explosive blasts., It is possible that these central auditory structures could be damaged by blasts, even in cases where those blasts do not generate the loss of consciousness required for a clinical diagnosis of mild TBI. Military blast exposure does not always occur due to enemy activity during combat. An important combat function for many military units is the use of explosive devices for forced entry into secured structures, which is called “breaching.” Individuals who perform this function are exposed to repeated blasts, not only during combat but also in training environments where they learn to deploy explosives for breaching. There are anecdotal reports from Service Members and police personnel in the United States, Canada, and New Zealand that some of these “Breachers” develop a myriad of symptoms that are similar to those in individuals diagnosed with concussions. The number of exposures may be even higher for individuals who are involved in breaching training, because they continue to be exposed to blasts while instructing within a repeating curriculum. In this study, we collaborated with the US Marine Corps (USMC) to study the effects of repetitive low-level blasts on individuals who train others in the techniques required for effective breaching with live explosives and are consequently exposed to an extraordinarily large number of blasts. The Methods of Entry Course (MOEC) at the Marine Corps Base, Quantico, VA, routinely conducts training in explosive breaching. The Marines line up in a “stack” close to a structure (e.g., wall, building) that is to be breached, and at a distance that seems safe, but that also allows for immediate access through the opening following detonation. The MOEC instructors teach while standing next to or within the stack and are exposed to as many as 246 blasts per year (six courses with 41 blasts each) over 2 to 3-year assignments. The 3-week MOEC repeats the same sequence of charges by size and location. Safety protocols for occupational blast exposures in controlled environments stipulate that the blast-exposures are not to exceed 4 psi in any single event. The 4-psi safety protocols are based on the average threshold for force on the human tympanic membrane that may cause a rupture without protection. The Breachers wear protective equipment and position themselves to eliminate higher order blast effects. However, helmet-mounted sensors on the field have measured overpressures as high as 6 psi (186 dB peak Sound Pressure Level or SPL) at the front of the stack, although they are less than 4-psi 95% of the time (unpublished data collected on site). The detrimental effects of low-level blast exposure have been reported elsewhere., In New Zealand, 21 Defence Force members were evaluated using serum brain injury biomarkers and neurocognitive tests seven and 14 days following 9 days of explosive entry training. They reported that neurocognitive dysfunction correlated with higher biomarker levels, and with an increase in self-reported symptoms. Historically, there are anecdotal reports from instructors complaining of hearing and balance issues following blasts, and this resulted in an observational study of 38 trainees and instructors at the MOEC in 2007. Auditory and vestibular data was collected pretraining, during 2 weeks of training, and shortly afterwards. Overall, they reported that several of the Breachers had statistically and clinically significant pure-tone threshold shifts [as defined by the Department of Defense (DOD) standard of 10 dB] at 2, 3, and 4 kHz more than 14 h after blast exposure, despite the use of hearing protection. However, only a minority of the Breachers experienced a permanent pure-tone threshold shift. In fact, a few even had lower thresholds (negative shifts) after exposure. 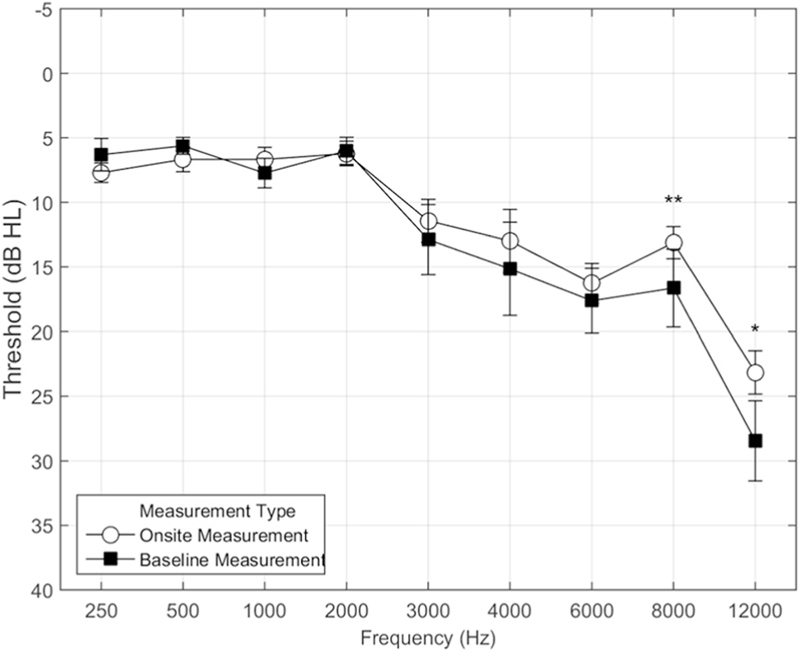 Meanwhile, the otoacoustic emission differences were slightly increased (better thresholds) at a few frequencies post training, but were only statistically significant near 3000 Hz, the same region where hearing threshold differences were found to be significantly worse. Although the earlier study did not find any major negative effects of blast exposure over the course of a single class at MOEC, the subjective reports of the training personnel in the MOEC classes provided motivation to perform a more in-depth examination of the longitudinal effects of repeated low-level blast exposure. Repeated blasts may cause subtle changes in the inner ear and the central auditory nervous system, and these changes may only be detectable with long-term longitudinal observation. As compared to the nonblast-exposed group, the blast-exposed group might have significant differences in performance of some of the auditory tests immediately after blast exposure. Positive findings would suggest that the breaching courses should be modified further to limit the exposure to even lower levels. This is a prospective, nonrandomized, descriptive study of a cohort of Marine breaching instructors. Data collection was performed at WRB and at the USMC Methods of Entry School at MCB Quantico, VA. This study was approved by the WRB Institutional Review Board and performed in accordance with the ethical standards of the Helsinki Declaration. This research was also monitored by the US Army Medical Research and Materiel Command, Fort Detrick, MD. This study included both auditory measures and vestibular measures, which were reported in an earlier publication. Study participants were Marines assigned to the MOEC. The study group “Breachers” consisted the Breacher cadres (n = 11), each of whom was repeatedly exposed to blasts while training students. The control group “Engineers” consisted of engineers (n = 4) assigned to support the MOEC. The engineers had similar demographics and work schedules to the study group but were not exposed to blasts. All participants used the same hearing protection throughout the study (Surfire EP3 Sonic Defenders® Filtered Flanged Earplugs, Surefire, LLC, Fountain Valley, California, USA), with a noise reduction rating of 24 dB (according to the product insert). They also wore Kevlar® body armor and helmets and polycarbonate ballistic goggles. Participants were excluded from study participation if they had any of the following conditions: (1) history of prior severe TBI, or other major neurological or psychiatric conditions; (2) deafness in one ear, or profound hearing loss (>80 dB hearing level or HL) at any frequency at or below 2 kHz. Following informed consent, each participant was provided demographic data, medical history including any prior concussions, symptom reports including responses to surveys (see the questionnaire description below) and comprehensive baseline assessments. The test measures were given over a 2-day time period for each participant and repeated approximately every 6 months for a period of 17 months. The purpose of the serial assessments was to identify any changes to auditory function over time. At the training site at Quantico, within an hour of the largest blast during the breaching course, each Marine also received shortened auditory assessments. These assessments were conducted in a trailer with a single-walled booth equipped with an audiometer and apparatus for testing otoacoustic emissions. The data collected were deidentified and entered into a database. The participants were assessed using both subjective and objective comprehensive measures that included questionnaires, neurotologic physical exams, and peripheral and central auditory tests at the hospital at WRB. At MCB Quantico, due to limited resources and time, pure-tone thresholds and distortion product otoacoustic emissions (DPOAEs) were measured along with two of the questionnaires, Neurobehavioral Symptom Inventory (NSI) and Functional Hearing Questionnaire (FHQ) (detailed below). Defense and Veterans Brain Injury Center – Used to screen for prior concussions upon enrollment in the study. NSI – Used to document the presence and severity of symptoms across cognitive, somatic, and emotional/behavioral domains during both the clinical and field evaluations. FHQ – Used as a self-report instrument to measure perceived hearing ability for complex listening tasks. Hearing speech in a variety of competing contexts. The directional, distance, and movement components of spatial hearing. Segregation of sounds and attending to simultaneous speech streams. The naturalness, clarity, and identifiability of different speakers, different musical pieces and instruments, and different everyday sounds. Each participant underwent a neurotologic examination (author P.D.L.) prior to the auditory assessments. This included an evaluation of the ears, eyes, cranial nerves, and cerebellar function. Conventional Audiometry and Immittance – Air conduction thresholds were measured from 250 Hz to 8 kHz, as well as high frequency thresholds (12 kHz using Telephonics Dynamic Headphones or TDH 50 headphones). Bone conduction was measured at 0.5, 1.0, 2.0, and 4.0 kHz. Speech reception thresholds used spondaic words presented with a live voice, and speech recognition used recorded phonetically balanced monosyllabic words presented to the test ear at 40 dB SL via TDH earphones. Tympanometry was with a 226-Hz probe tone and 300 to 400-daPa pressure (GSI TympStar Tympanometer, Grason-Stadler, Eden Prairie, Minnesota, United States). Pulsed tones were presented at 500, 1000, and 2000 Hz at 70 to 105 dB HL for ipsilateral and 70 to 110 dB HL for contralateral stimulation. Baseline – Speech presented binaurally in the presence of diotic 4-talker babble. NoSpi – Identical to baseline, but with target 180° out of phase across the ears. AV – Identical to baseline, but with a visual depiction (movie) of talker presented on screen. AV/NoSpi – Combining the AV and NoSpi conditions. Spatial – Similar to baseline, but virtual audio used to place 4-talker babble ±90°. Reverb – Same as spatial, but with simulated room reverberation. Reverb + Time Compression – Same as Reverb, but with speech sped to 150% normal rate. Speech-shaped noise – Same as baseline, but with babble masker replaced with noise. DPOAEs were tested using two primaries presented at a level of 65/55 dB SPL, with a fixed ratio of f2/f1 = 1.22, and the signal level recorded at 2f2-f1 frequency using the Otoport Advance (Otodynamics Ltd, Hatfield, United Kingdom). Two points were obtained per octave for a frequency range of 1 to 8 kHz. Averages of two test trials were conducted for each person. Staggered spondaic word test (SSW) – The SSW test examines a listener’s ability to segregate and interpret competing speech presented dichotically to both ears. Gaps-In-Noise Test (GINT) – The GINT is a test of temporal resolution and has been shown to have moderate sensitivity for identifying participants with lesions in the auditory cortex or corpus callosum, and it has high test–retest reliability. A threshold was estimated based on the smallest gap for which the participant scored greater than 50% detection (gap detected on at least four of the six presentations), with all longer durations receiving a score greater than 50%. The threshold is an estimate of the shortest temporal gap that a listener can detect. Masking level difference (MLD) – The MLD test is a psychophysical measure that evaluates temporal precision and the ability to link acoustic information coming to both ears, which occurs earliest at the level of the superior olivary complex, at or above the mid brainstem., A 500-Hz tone was used for the MLD task. The difference in threshold between the homophasic and antiphasic conditions is defined as the binaural MLD. Auditory brainstem response (ABR) – Clicks were presented through ER-3A (300) insert earphones. These were 100 μs at 80 dB normal HL, at a rate of 17 clicks per second for each ear independently. Auditory Evoked Potential P300 – The late auditory evoked potentials are derived from multiple structures that are higher in the brain than in the ABR. Neural generators include thalamic projections to the auditory cortex, primary auditory cortex, supratemporal plane, temporoparietal association cortex, frontal cortex, reticulothalamus, and the medial septal area. The event-related P300 waveform gives insight to the function of higher order structures of auditory processing and cognition. The P300 uses the same electrodes as the ABR, with the addition of electrodes above and below the left eye to monitor eye activity. Data with ocular artifacts greater than 60 μV were rejected automatically to prevent spurious electrical activity from being averaged into the response. The gain of each electroencephalography channel was 100,000. The low-frequency cutoff of the bandpass filter was 1 Hz, and the high-frequency cutoff was 30 Hz. The late latency response (LLR) was elicited binaurally using an “oddball paradigm.” During each averaging epoch, the “frequent” (standard or common) signal – a 500 Hz tone – was presented diotically 80% of the time at 75 dB SPL. A 1000 Hz “oddball” (deviant or rare) signal was also presented diotically at pseudorandom intervals 20% of the time, also at 75 dB SPL. Participants were asked to count the number of higher pitched (1000 Hz) tones silently to themselves. The rise time of tonal stimuli was 10 ms, the plateau 50 ms, and the fall time 10 ms, using a Blackman envelope. Each test run was terminated when 50 acceptable oddball responses were averaged. The final LLR comprised an average of two repeatable runs for at least 100 individual responses to the deviant signal. The latency and amplitude of the LLR was compared to the P300 baseline. The goal of the study was to identify any changes in auditory function in a study group exposed to low-level blasts during a period of 1 to 2 years, and to compare their performance to a demographically similar group of Engineers not exposed to blasts. The primary analyses were within-participants and repeated-measures analyses. In addition, secondary analyses were conducted to identify differences between the Breachers and the engineers and systematic differences between measurements made immediately after a blast on-site at Quantico and the baseline measurements made at WRB. Three comprehensive evaluations in Spring 2012, Fall 2012, and Summer 2013 were completed at WRB [Table 1]. Ten acute evaluations beginning in Spring 2012 and ending in Fall 2013 were done at MCB Quantico within an hour after the Breachers were exposed to the largest blast-explosion during training. The engineers were tested within the same time period. None of the participants had any reportable adverse events. Participation and duration of observation are summarized for each participant in [Table 1]. As shown in [Table 1], the engineers on average had more comprehensive evaluations at WRB than did the Breachers. The average number of acute evaluations was similar among groups. A total of eleven Breachers and four Engineers were enrolled. All subjects were male and their characteristics are summarized in [Table 2]. Six indicated a prior history of mTBI; five Breachers and one Engineer. Three subjects with mTBI reported that they were from blasts during combat. The other three reported that they were sports-related, including the one Engineer with an mTBI, and the one subject with two injuries (Breacher). All of these events were at least two years prior to enrollment. Additionally, two subjects had prior tympanic membrane perforations. One was from a non-blast external ear trauma (Engineer), and the other was from an improvised explosive device during combat (Breacher). These perforations healed years prior to enrollment. Three comprehensive evaluations were completed at WRNMMC. These were in Spring 2012, Fall 2012, and Summer 2013. Ten acute evaluations were done at MCB Quantico. These began in Spring 2012 and ended in Fall 2013. There were no reportable adverse events or concerns for malingering. Subject participation and duration of observation are summarized in [Table 2]. There was variability in the number of test sessions among subjects. The Engineers averaged twice as many comprehensive evaluations at WRNMMC than did the Breachers. The average number of acute evaluations was similar among groups, but the Breachers had more variance, ranging from 6 to 15. A summary of the results of the questionnaires and auditory measurements is shown in [Table 3] and [Table 4]. The data for each variable in the table were analyzed to eliminate outlying data points by first calculating the within-participant standard deviation for each variable. This was followed by identifying all the cases where the within-participant deviation for repeated measures of a variable for a given participant was more than 1.5 standard deviations from the average within-participant standard deviation. In cases where that occurred, all data points from the participant with the unusually-high within-participant standard deviation that were more than three standard deviations from the mean value for that variable were eliminated from the analysis. This process eliminated trials where a participant performed similar to the other participants on most repeated measures, but had a small number of extreme outliers. There were 71 such outliers out of approximately 23,000 total data points in the study. Of these, 19 were from Participant 9, whereas the remaining 52 were more evenly distributed across the other participants. Ideally, a study like this one would be conducted with the same number of equally spaced baseline and field evaluations for all the study participants. However, because the study was constrained by the actual class schedules and availability of the participants from the MOEC, it was not possible to achieve this goal. There was a great deal of variation in how many times each participant was tested, when those tests occurred, and how much time elapsed between tests. Because of this, longitudinal trends were evaluated by linear regression to calculate the slope for each variable across the data points for each individual participant. Simple t tests were then used to see if these slopes differed from the null hypothesis (that the variables were constant throughout the experiment), or from the slopes of the Engineer controls. [Figure 1] illustrates a longitudinal analysis for the 2 to 4 to 8-kHz high-frequency pure-tone average (PTA) audiometric thresholds versus the number of quarters elapsed from the start of the study. The top two rows show data for the Breachers, whereas the bottom row is the nonblast-exposed control group (engineers), each of which is depicted by participant number. This is arbitrarily divided across four panels in each row to minimize overlap between individual participants. 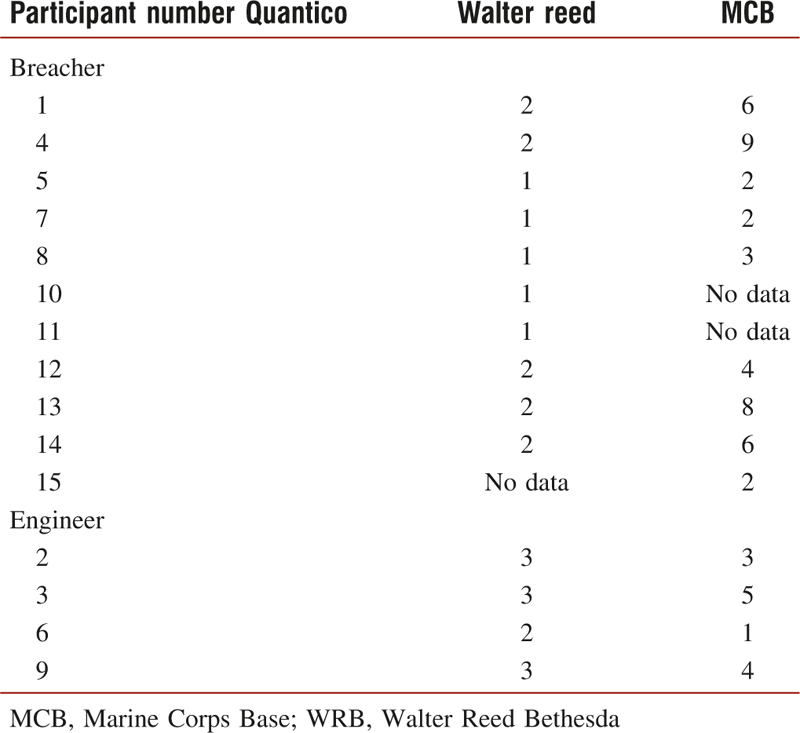 Within each panel, the black numbers are the participants during baseline clinical measurements at WRB, and the light gray numbers are the participants during the field measurements at MCB Quantico. The lines in the figure are linear regressions of the PTA versus time for each participant, and these lines are centered on boxes containing the participant numbers. The numbers at the bottom left of the figure represent the mean slope of this regression curve (in dB per week in this case) for the Breachers (mb) and the engineers (me). The numbers in the bottom middle of the figure show the P value (as measured by two-tailed t tests) for the two hypotheses. Figure 1: Longitudinal analysis of 2-4-8 kHz high frequency PT average for Breacher and Engineer groups. Each data point represents a different measurement, with the dark digits indicating baseline audiograms measured at Walter Reed and the light gray digits indicating field measurements made during a class held at MCB Quantico. The regression lines associated with Breachers are shown by the white squares in the first two rows, while those associated with Engineers are indicated by the gray squares in the bottom row of the figure. See text for details. [Table 3] summarizes the results of the NSI, FHQ, and SSQ. The NSI survey results did not show any evidence of sensory system changes over time. The Breachers ratings were similar to the engineers, and the scores for both groups were within published norms. There was no difference between the scores obtained immediately after blast-exposure at MCB Quantico and the scores from WRB. The same pattern was observed for the FHQ and the SSQ composite scores, with no significant differences over time, between participants, or across sites. Symptom Inventory (NSI), Functional Hearing Questionnaire (FHQ), and Abbreviated Speech, Spatial, and Qualities of Hearing Questionnaire (SSQ). The NSI was used to document the presence and severity of symptoms across cognitive, somatic, and emotional/behavioral domains. Functional Hearing Questionnaire (FHQ) and Abbreviated Speech, Spatial, and Qualities of Hearing Questionnaire (SSQ) was used to measure perceived hearing ability for complex listening tasks. None of these tests show statistically significant differences over time, between participants, or across sites (P > 0.05 for all). To determine if there were acute peripheral auditory changes after blast exposure, air conduction thresholds obtained at each session were subjected to three-way between-participants analysis of variance (ANOVA) on the main effects of participant type (Breacher or engineer), test frequency (nine values from 250 Hz to 12 kHz), and measurement condition (on-site or baseline). The results indicate no significant main effect of participant type, but a significant main effect of test location [F (1, 10) = 6.073, P < 0.033], as well as a significant main effect of test frequency (P < 0.001). There also was a significant interaction between test frequency and test session type [F (8, 80) = 4.414, P < 0.001]. As there was no significant main effect of participant type, [Figure 2] shows the mean threshold measured at each frequency for the on-site and baseline measurement sessions collapsed across both participant types. From these results, it is apparent that there was a tendency for the participants to have significantly better hearing thresholds during the on-site measurement sessions than they did at the baseline measurement sessions, particularly at high frequencies. As with pure-tone audiometry, DPOAEs were collected for each participant during the baseline and on-site assessments. [Figure 3] shows the mean DPOAE amplitude values measured for the Breachers and engineers combined at the two test sites, MCB and WRB. There was a trend for the average DPOAEs to be higher on-site than in the baseline measurements, particularly for 2 to 8 kHz ([Figure 3]). This trend was confirmed by three-factor ANOVA for participant group, measurement site (MCB or WRB site), and frequency and found a significant main effect of measurement site [F (1, 9) = 19.57, P < 0.002] and frequency [F (12, 108) = 5.83, P < 0.001], as well as an interaction between these two variables. The DPOAEs were significantly lower for measurements made immediately after blast-exposure onsite at Quantico in the mid frequencies from 2400 to 4000 Hz than at WRB. 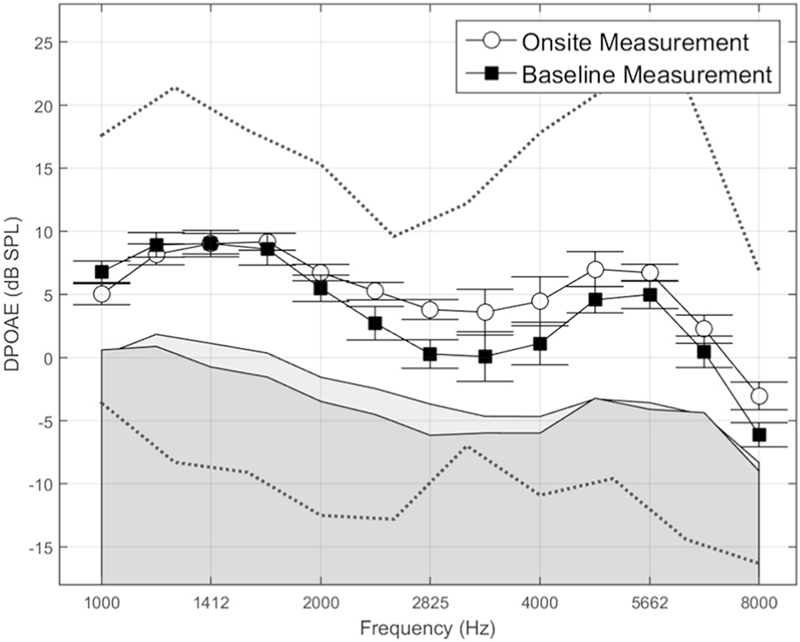 The results of the DPOAE measurements are counterintuitive as they suggest stronger DPOAE activity shortly after noise exposures on the range, but they are consistent with the audiometric thresholds that showed better performance at the range. This is discussed later. This study included both behavioral and physiologic auditory measures. None of the central behavioral tests (SSW, GINT, and MLD) showed any significant differences between the two groups or differences within each group over time. Several Breachers and engineers performed worse than expected compared to normative data, particularly with the Time-Compressed/Reverberation Quick SIN (shown in [Figure 4] left panel) with the SSW (shown in [Figure 4] right panel). It could be speculated that elevated hearing thresholds may result in a decrease in performance on the modified Quick SIN. Other than Participant 13 (Breacher), who had some high frequency hearing loss and poor performance on the Quick SIN, the hearing thresholds do not otherwise appear to predict test performance. As shown in [Figure 4], results show that performance was particularly poor for Participant 9 (engineer), and yet he had some of the best audiometric thresholds in the group. This participant also struggled at some of the other speech perception and central auditory processing tasks and tended to have highly variable results across all the experiments. By contrast, Participant 14 (Breacher) had the poorest pure-tone thresholds and performed normally on the SIN task and the central tests. Three other listeners (3, 12, and 13) also performed outside of the normal range. Two of these listeners (3 and 13) had elevated hearing thresholds that might have accounted for the poor performance. [Table 4] summarizes the audiometric variables. The middle panel shows the objective hearing measures including the number with abnormal Tympanometry and abnormal acoustic reflex thresholds, and the average distortion product otoacoustic emissions (DPOAEs). Pure-tone thresholds are lower immediately after exposure at several frequencies than measurements made weeks to months after exposure at WRB. A similar pattern was found for both groups with DPOAEs. The lower panel shows the central auditory measures (performed at WRNMMC only), so there is no site-comparison data. SSW scores were not significantly different across time or group (P > 0.05 for all). The GIN threshold was not significant different across groups (P > 0.05), but each participant was only tested once, so across-time differences are not reported. The MLD did not show significant differences across time or group (P > 0.05 for all). The ABR latencies were found to be similar between the two groups. For the right ear the average wave I latency is 1.55 ± 0.21 Ms for the Breacher group and 1.67 ± 0.17 for the engineers. These differences were not statistically significant (P = 0.27). For wave III, the Breachers were 3.91 ± 0.20 ms, and the engineers were 3.58 ± 0.10 ms, which also was not statistically significant (P = 0.95). Wave V latencies were 5.86 ± 0.15 ms for the Breachers and 5.59 ± 0.08 ms for the engineers, showing no significant differences between the two groups (P = 0.30). A similar pattern was observed for the left ear, with the exception of Wave III, where the two group means 3.84 ± 0.09 ms for the Breachers and 3.67 ± 0.17 ms for the controls were found to be statistically different (P = 0.03). However, the effect size was small, and both group latencies were within normative values used in the Walter Reed Audiology Clinic. The P300 latencies to sounds presented to both ears simultaneously were slightly longer (317.42 ± 30.74 ms) in the Breachers compared to the engineers (292.06 ± 28.79 ms). These differences did not reach statistical significance (P = 0.24). The amplitudes for the P300 were also similar for the two groups at 4.8 + 2.59 μV for the Breachers and 4.86 + 2.55 μV for the engineers (P = 0.997). An additional analysis was completed to determine if there were significant differences in performance between participants with and without prior mTBI. The results show that only two tests reach the level of statistical significance. The two tests were the Quick SIN and the acoustic reflex, but surprisingly the participants with mTBI had lower SNRs and fewer abnormal acoustic reflex findings, opposite of what one would expect for clinically significant findings. The long-term effects of repeated, low-level occupational blast exposure on the auditory system is deficient in the literature. High intensity blast exposure is perhaps better understood and is known to cause damage to the peripheral and central auditory systems, as well as to various other structures within the brain.,, The safety threshold levels used for occupational blast exposure during training are based on studies that evaluated the force required to rupture a human tympanic membrane. However, the safety threshold for injury to the sensory systems and the brain – particularly with repeated exposure – is unknown. By evaluating Marines exposed to repeated low-level blasts, we hoped to better understand whether these cumulative exposures are safe to the auditory system. If not, then it is critical to understand the risks, identify sensitive assessment tools, and reduce the harmful effects whenever possible. To date, there are limited studies on Breachers, or any type of group exposed to repeated blasts. This study is by far the most comprehensive in terms of the number of auditory tests used, number of repeated measurements, and the duration of observation. Our first hypothesis was that longitudinal evaluation of within-participant repeated measures would reveal more auditory symptoms and abnormalities in the Breacher group as compared to the Engineer group. These tests of speech perception, central auditory processing, and electrophysiology did not reveal any group differences, or any significant decline in performance over time. Multiple subjective assessments were included in this study as Service Members have anecdotally reported neurobehavioral symptoms from blasts. Analysis of these validated questionnaires did not reveal an abnormal level of symptoms, or any significant differences in symptom ratings over time in either group, and thus did not verify these anecdotal reports. Our second hypothesis was that immediately following a blast, the Breachers would exhibit more auditory abnormalities than the engineers. There was no evidence of detrimental effects following low-level blast exposure in the Breachers than the engineers despite the use of a multitude of tests. One unexpected finding was that both DPOAEs and audiometric thresholds were slightly better for both groups when measured at MCB Quantico instead of WRB. A priori, one might have expected the audiometric thresholds to be worse at MCB Quantico and especially for the Breachers as they were all exposed to blasts immediately prior to testing. Equipment differences are one obvious concern, but the audiometer at MCB Quantico was recalibrated during the trial and determined not to be a contributing factor. Moreover, there was no variability in DPOAE equipment or testing environment to account for the unexpected higher DPOAE amplitudes obtained at MCB Quantico. The reasons for these differences are unclear, but perhaps environmental factors such as physical exertion and emotional arousal have nuanced effects on hearing. Only a handful of studies have evaluated the effects of blast-exposure on central auditory processing. The present study is the only one thus far that has evaluated the effects of repeated low-level blast-exposure on hearing during military training. Several measures of auditory processing using both behavioral and electrophysiologic measures were completed, and the findings were negative. Several individuals in both the engineer and Breacher groups performed worse than would be expected in a normal population on several central auditory processing and speech perception tests (particularly the SSW and the Quick SIN with Time-Compressed Speech and Reverb). 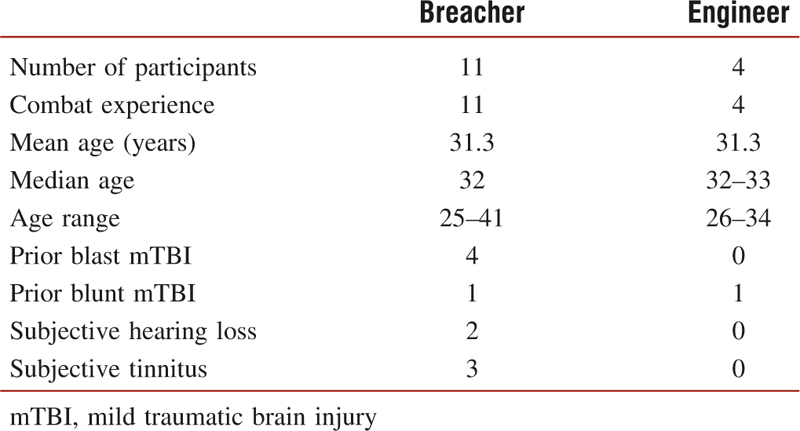 However, this did not correlate strongly either with the participant group (Breacher or engineer), or with a prior history of mTBI. This, along with the small sample size in the study, makes it difficult to draw strong conclusions about the impact of low-level blast on auditory processing. However, it should be noted that the Breacher group in this study appeared to be much less impaired on central auditory processing tests than the blast-exposed population with normal audiometric hearing tested by Gallun et al. This may suggest that the repeated low-level blast exposures of training are not as detrimental as the larger and less predictable blasts typical of recent combat operations. The participants in the present study knew when a blast was about to occur, and they used blast-shields, hearing protection, and helmets. In contrast, the participants in the Gallun study lacked advance warning and often did not have adequate protection during exposure. A reasonable conclusion is that the protection and safety measures (i.e., lower levels of blast exposure) may have prevented obvious damage to hearing based on results from this study. It was critical to the IRB and military command approval of this study that the research had to be strictly observational and minimally disruptive to the tempo of the training. This meant that we did not have control of any variable – especially the blasts. Prestudy field testing using helmet-mounted sensors measured overpressures as high as 6 psi (186 dB peak SPL) at the front of the stack (data courtesy of William Ahroon, PhD, Breacher Injury Study Final Briefing, USAARL, 2009). However, no additional measurements were taken during our data collection period, so we are unable to give exact noise exposure levels for each Breacher. The sizes of our test and control groups were also limited by the number of instructors and engineers available. Given the constraints inherent in the execution of a field study of this type, we believe these results provide the most comprehensive data available on the long-term effects of repeated low-level blasts on a wide range of behavioral and nonbehavioral tests of auditory function. Although an ideal study would have had more consistent participation from the participants in terms of the number of tests and the intervals between the tests, we do not believe there were any realistic ways to ensure more consistent enrollment for this group without interfering with their work. The only practical way to increase the power of this study would be to follow several cycles of Breachers through their MOEC assignments, which may take 2 to 3 years per iteration. Although the sample size of this study was too small to make ironclad predictions about the impact of repeated low-level blasts on auditory function, we believe it is important to report our results. This will guide the design of future studies, and it provides interim information on this important subject until a more comprehensive study can be conducted. This study evaluated whether or not repeated low-level blasts affect auditory function in a group of USMC Breachers. Overall, the Breachers appeared to perform similarly to a small control group of engineers who had similar demographics, but who were not exposed to blasts. There was no evidence that the repeated blasts had any negative acute or long-term effects on hearing, at least at the current exposure levels, and as measured by a comprehensive battery of the most current tests. There were some small differences between the hearing thresholds and DPOAEs collected at the demolition range and those collected in the clinic, paradoxically suggesting slightly better auditory function at the range. Additional longitudinal research will be needed to confirm these findings. We thank Dr. Ahroon and his colleagues at the US Army Aeromedical Research Lab for providing their insight and supporting this research. The study would be impossible without the collaborative partnership with the Marine Corps at Quantico. These Marines generously shared their time, experience, and subject matter expertise toward our mutual goal of understanding the effect of low-level blast exposure on sensory function. Although we are at the early stages of determining the long-term effects of blast injury, the study is an important step. It has been our honor to work with such thoroughly skilled, dedicated, and courageous Military Service Members. The research was supported by a Department of Defense Intramural War Supplemental Grant (award number W81XWH-09-2-0192) awarded to William Ahroon. The grant was provided by The US Army Medical Research and Materiel Command, Intramural War Supplementation Program, award number W81XWH-09-2-0192. Tanielian T, Jaycox L. Invisible wounds of war: Psychological and cognitive injuries, their consequences, and services to assist recovery. Tanielian T, Jaycox L, editors. Invisible Wounds of War: Psychological and Cognitive Injuries, their Consequences, and Services to Assist Recovery [Report]. Santa Monica, CA: RAND Corporation 2008. Lew H, Jerger J, Guillory S. Auditory dysfunction in traumatic brain injury. J Rehabil Res Dev 2007;44:921-8. Hoffer M, Balaban C, Gottshall K, Balough B, Maddox M, Penta J. Blast exposure: Vestibular consequences and associated characteristics. Otol Neurotol 2010;31:232-6. Gallun F, Diedesch A, Kubli L, Walden T, Folmer RF, Leek M. Performance on tests of central auditory processing by individuals exposed to high-intensity blasts. J Rehabil Res Dev 2012;49:1005-24. Brungart D, Kubli L, Sheffield B, Phatak S, Makashay M, Grant K. Evaluating functional hearing deficits in blast-exposed personnel with normal hearing thresholds. Abstract PS-517. Association for Research in Otolaryngology, 37th Annual Midwinter Meeting, February 22-26, 2014. Kujawa S, Lieberman C. Adding insult to injury: Cochlear nerve degeneration after “Temporary” noise-induced hearing loss. J Neurosci 2009;29:14077-85. Chafi M, Karami G, Ziejewski M. Biomechanical assessment of brain dynamic responses due to blast waves. Ann Biomed Eng 2010;38:490-504. Ling G, Bandak F, Armonda R, Gerald G, Ecklund J. Explosive blast neurotrauma. J Neurosci 2009;26:815-25. Amsc N, Hfac AA. Department of Defense Design Criteria Standard (IAW MIL-STD-1474) (1999). Accessed from http://www.everyspec.com. [On December 30, 2015]. Signal, 44(5.3), 4. Tate C, Wang K, Eonta S, Zhang Y, Carr W, Tortella F et al. Serum brain biomarker level, neurocognitive performance, and self-reported symptom changes in soldiers repeatedly exposed to low-level blast: A breacher pilot study. J Neurotrauma 2013;30:1620-30. St Onge P, McIlwain DS, Hill ME, Walilko TJ, Bardolf LB. Marine Corps Breacher Training Study: Auditory and vestibular findings. US Army Med Dep J 2011;97-107. Littlefield PD, Pinto RL, Burrows HL, Brungart DS. The vestibular effects of repeated low-level blasts. J Neurotrauma 2016;33:71-81. Gatehouse S, Noble W. The Speech, Spatial and Qualities of Hearing Scale (SSQ). Int J Audiol 2004;43:85-99. Killion M, Niquette P, Gudmundsen G, Revit L, Banerjee S. Development of a quick speech-in-noise test for measuring signal-to-noise ratio loss in normal-hearing and hearing-impaired listeners. J Acoust Soc Am 2004;116:2395. Brungart D, Sheffield B, Kubli L. Development of a test battery for evaluating speech perception in complex listening environments. J Acoust Soc Am 2104;136:777-90. Katz J. The SSW Test Manual. 15th ed. Vancouver, Canada: Precision Acoustics; 1998. Musiek F, Shinn J, Jirsa R, Bamiou D, Baran J, Zaida E. GIN (Gaps-In-Noise) test performance in subjects with confirmed central auditory nervous system involvement. Ear Hear 2005;26:608-18. Jerger J, Brown D, Smith S. Effect of peripheral hearing loss on the masking level difference. Arch Otolaryngol 1984;110:290-96. http://dx.doi.org/10.1001/archotol.1984.00800310014003. Wilson R, Moncrieff D, Townsend E, Pillion A. Development of a 500-Hz masking-level difference protocol for clinic use. J Am Acad Audiol 2003;14:1-8. http://dx.doi.org/10.3766/jaaa.14.1.2. Musiek F, Baran J. The Auditory System: Anatomy, Physiology, and Clinical Correlates. Boston, MA: Allyn & Bacon; 2006. Soble JR, Silva MA, Vanderploeg RD, Curtiss G, Belanger HG, Donnell AJ et al. Normative Data for the Neurobehavioral Symptom Inventory (NSI) and post-concussion symptom profiles among TBI, PTSD, and nonclinical samples. Clin Neuropsychol 2014;28:614-32.